Depending on where you live current kitchen styles vary. Pompano Beach is known for lots of sunshine and good food, and as a result our kitchens are uniquely fantastic. 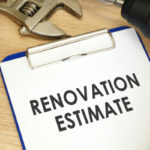 Here are 10 things the latest Pompano Beach kitchen remodels are including to make the most out of Florida living. Living in the beautiful sunny state of Florida means windows are always going to be a popular addition to kitchens. Windows instantly make a space feel larger and more open, a bonus all on its own. To make things even better, windows offer you a chance to open up and let in some fresh air, which can be especially useful when you are cooking up something extra smoky. Good kitchen light allows you to bring in indoor plants that will thrive and beautify your kitchen. Plus, natural light means less wasted electricity. Why not deck out your kitchen in bright shades of blue to highlight our state’s love affair with the ocean? There was a time when adding lots of bright colors to your kitchen resided on the rare side but that’s all changing now as more unique color trends are on the rise. Custom cabinets are becoming more and more popular as people customize their kitchens to fit their needs as opposed to the ‘average’ person’s needs. Custom cabinets can add more value to your home due to aesthetics and quality as they are going to last longer. Plus, when you buy wholesale custom cabinets in Florida you are instantly going to save money. You might even end up spending nearly the same as you would on retail stock cabinets. Thanks to the beautiful weather here in Florida many people love cooking outdoors just as much as indoors. As a result, kitchens are being built inside and outside. If you build a kitchen outdoors, place it near your indoor kitchen so that you can share the same water and electricity source. Add a door to your main kitchen that leads outside to your outdoor kitchen for even more convenience. If you have the budget, a popular new idea is to add a set of bar stools and a bar-like table that extends from the outside of the house. Add a large window here that opens up to connect your kitchen to this unique outdoor eating and socializing space. This provides the perfect way to bring the outdoors in and visa-versa. Granite has remained one of the most popular kitchen countertop materials for many years thanks to its good looking varied exterior and long-term durability. Granite is naturally made by the Earth to stand up to all challenges and also comes in many different colors and styles. Nautical themed kitchens are on the rise, as more and more people opt for seashell décor and navy blue and white stripped accents. Living in Pompano Beach you have every excuse to go for a beach themed kitchen, after all you live the part! You can get creative with décor adding nautical artwork, seashell figurines or starfish-shaped hardware knobs for cabinetry. Chandeliers in entryways, bedrooms and kitchens, in this day and age you can’t have enough chandeliers. The great thing is chandeliers come in all different styles, so no matter what sort of theme your kitchen is going for there is an option for you. You can hang one above the sink, center island or over the kitchen table, your options are endless. The need to go green has never been clearer. If we want to keep planet Earth alive for many more generations to come we have to change the way we do things and shoot for more sustainable remodeling methods. As a result, many people are re-thinking kitchen design and functionality in order to reduce their own ecological footprint. There are many ways you can go eco-friendly in the kitchen, for instance you can design the overall layout to reduce the amount of electricity you use on a regular basis. Or, you could make sure that all materials used to create your kitchen are obtained from a sustainable or repurposed source. There are a number of backsplash options for kitchens. 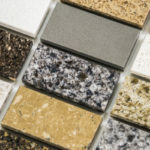 One way to save money on your remodel is to use the same materials used for countertops for your backsplash. The excess materials you order that you do not use can be placed here so that you don’t have to order a different material. Or, you can get creative and play around with fun tiles and other materials. 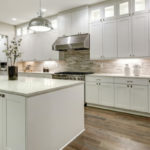 Your kitchen backsplash says a lot about the overall style and theme of your kitchen, something Florida residents are using to their advantage when it comes to making a style statement. The sink is a well-used part of your kitchen. It’s where you find yourself every night after dinner, scrubbing dishes and tidying up. All throughout the day you turn to your sink, even to simply wash your hands as you go about your routine. 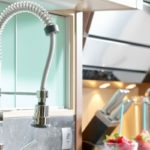 As a result, it’s becoming more popular to add high end finishes to the kitchen sink, as well as things that make your sink more functional to use. Such as an extendable faucet or ultra-deep sink basin. Tops Kitchen Cabinet is leading the way for affordable kitchen remodels in Pompano Beach. Check out our wide selection of inventory at wholesale prices fit for every budget.